AthleteProgress helps you capture and capitalize on more teachable moments and store them for a lifetime of athlete education and success. AthleteProgress is purpose built for sports clubs, teams, and private coaches that want to clarify and expedite athlete feedback, measure individual and team progress over time, and understand efficacy of teaching concepts. Based upon the theory of Deliberate Practice, AthleteProgress is optimized for use on mobile, tablet, laptop, or desktop interfaces with each interaction designed to help Coaches and Athletes get the most out of each engagement. Your Resources, Instantly Accessible in One Place. You've got a lot of people to manage. Having to manually invite everyone is a no-go. We've built systems to mass-invite all of your membership and have documented the process in a way that keeps your email inbox empty and phones from ringing off the hook. Let AthleteProgress do the heavy lifting while you enjoy the benefits of a system that just works. At-A-Glance Dashboards for Admins, Coaches, Athletes, and Parents optimized around the information that each of your stakeholders need to arrive on time and perform at their best. We've worked with heads of sport and elite level coaches to develop a comprehensive set of skills, discipline or position, and performance tags with which to track and evaluate each athletes peformance. No matter whether your staff uses the highest quality video camera or their smart phone camera to capture athlete video, AthleteProgress helps to quickly upload video and get it to your athletes. Once uploaded and tagged, every single video is searchable for a lifetime. Gone are the days of dumping video online and hoping that your staff and athletes are getting good use out of it. If there's one thing that leads to a full inbox and a phone ringing off the phone, it's an unclear agenda for any sporting event. With Location specific events and the ability to tie them to teams or athletes, gone are the days of confusion as to where and when athletes need to be somewhere. Even better, you can tag event agenda items by either an address or GPS location with additional notes on how to find that place. Chances are pretty good, you've captured thousands of hours of video in your career and if you haven't yet, you certainly will. In those many hours of video are thousands of teachable moments. With AthleteProgress, you can upload videos instantly using our mobile site or many at a time via our video upload tool. Each tool allows you to tag locations, disciplines / positions, focus skills, record feedback, and tag environmental factors that impact athlete performance. Now, you've got a tool that takes all of the video you've captured and puts it to work helping you to do an even better job of educating your athletes over the lifetime of your coaching career. We've created dashboards for your Coaches, Athletes, and Parents. These dashboards are optimized around the At-A-Glance information that each of you need. They keep for fellow Coaches on-task and up to date. Athletes know what is expected of them and what they need to focus on. Parents know when and where their athletes need to be and what the various plans are. These communication tools reduce redundant emails in your inbox, time consuming calls, and help you do what you do best. In a world where athletes have hundreds of things going on each week, parents need to be kept in the loop. AthleteProgress gives them a simple dashboard to log in and see their athletes training schedules and training progress. Parents are proud of their athletes. It doesn't matter if they're 6, 16, or 26. As such, for programs who choose to provide it, parents are able to access their athletes profiles, view their videos, and track their progress. Interview any top athlete and they'll almost instantly support how valuable journaling is. AthleteProgress has made it super easy for Athletes to track their diet, sleep, health, fitness, and mood. With Location specific events, athletes know when and where they need to be and what they need in order to be successful. In a world where athletes have 100's of things going on each week, parents need to be kept in the loop. AthleteProgress gives them a simple dashboard withwhich to log in and see their athletes training schedules and training progress. In our line of work, there are no breaks. We're interacting with Athletes at an incredibly high frequency and the expectations are clear... deliver athletes to excellence. No excuses here, we've got a job to do. Problem Solved. With an easy to use interface for your mobile device or tablet becomes your best friend. As each athlete executes a race, play, skill or drill, you're able to quickly capture video, provide immediate feedback, and easily move to the next athlete. Video is a critical learning tool in every sport. With AthleteProgress, you can provide that and much more with our sport specific skills, and performance tagging. During a given training session, an athlete can go for hours without truly impactful, contextual, and meaningful feedback. Conversely, they might be bombarded with feedback on a range of unrelated skills from a range of coaches. Both scenarios are common, incredibly frustrating, and unproductive for the athlete. AthleteProgress solves this problem by making it easy for coaches to focus on one set of skills and connecting the athlete with their coach's analysis and feedback after every run. Via the mobile device of choice, an athlete can quickly review skill focused analysis and feedback as they head back up the hill for their next run. Gone are the days of pointless and often misinterpreted feedback over the radio. Leveraging the near ubiquitous access to mobile technology, we're able to serve context rich feedback from coach to athlete in near real-time. “Athlete Pro” provides a unique platform from which clubs, coaches and organizations may quantify critical metrics used for athlete evaluation, progression development, and evaluation. The program provides coaches and athletes with the necessary tools for relevant performance evaluation, along with a user friendly platform application for use in the field. 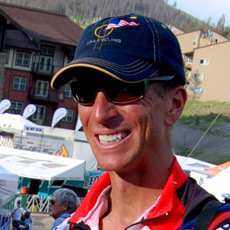 Scoring metrics, categories, results and feedback are simple to use, efficient, and provide the coaching staff the dynamic opportunity to share information, produce reports, and deliver key coaching points to athletes across a variety of disciplines (freeski drills, slalom, giant slalom, SG and DH elements). 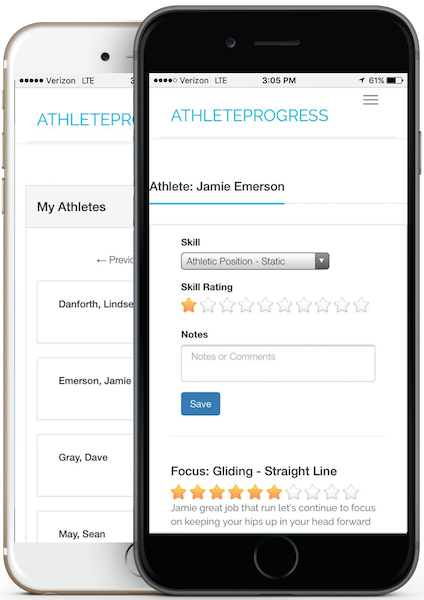 The Athlete Pro application layout allows the coach, athlete and parent to access relevant data from evaluation scoring, to unique coach feedback comment section, to overall graphs, charts and more for long term planning and development. Similar to athlete “video” review sessions, Athlete Pro assists with tracking athlete progress, scoring comparisons (club/region), and identifies key themes that are critical high performance outcomes. The Athlete Pro program is simple to use, provides real-time feedback to the athletes, and is designed specifically to address performance based feedback critical to long-term athlete development. The versatile application may be utilized from grassroots development programs (DEVO), to FIS level competitors. AthleteProgress | Athlete Feedback and Performance Analysis, Simplified. Take athlete and coach education, club and team communication, as well as club or team organization, and operations to the highest levels.